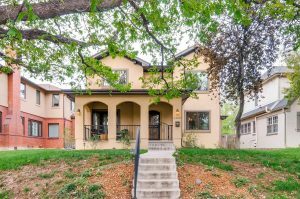 Mediterranean Spanish style home sits on a beautiful, quiet, tree-lined block in Park Hill was modernized in 2011. The home features beautiful finishes and plenty of space for living, relaxing, and entertaining. 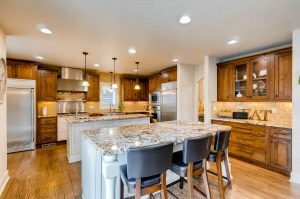 The gourmet kitchen has two oversized islands allowing a work station and an entertainment island with sitting space for your friends and family with a flowing open floor plan. The 6-piece master bathroom is large and luxurious with each bedroom upstairs having en-suite facilities and laundry also on the 2nd floor. 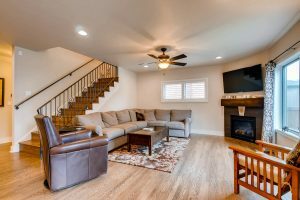 The fully finished basement includes a rec room, bedroom full bathroom, and storage. It also comes with a few other surprises like a Juliet balcony off the master bedroom, attached garage, mudroom and built in coffee machine. The spacious yard features a large lawn & outdoor entertaining area. Take a moment to sit on the front porch and experience this beautiful home oasis. This is a true gem in McAuliffe and East High District.